After back-to-back La Niña winters, we’re changing things up with an El Niño for the Winter of 2018-2019. El Niño and La Niña both describe changes in the water temperatures across the Tropical Pacific Ocean that have well-known impacts on the global weather pattern. An El Niño is a warming of those waters, and tends to invigorate the southern jet stream, a key element in this year’s forecast. The El Niño this winter is expected to be weak in intensity and centered closer to the central Pacific. 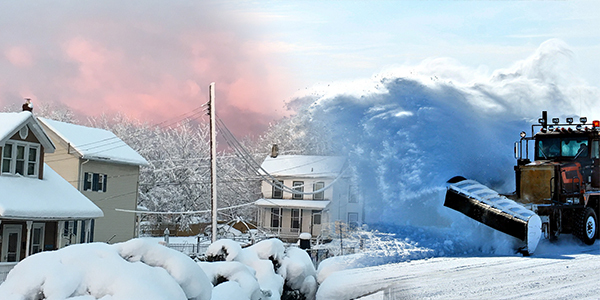 Weak El Niños tend to produce colder winters across the country than stronger ones (which produce milder winters), and “central-based” events also have the same result. This gives us a base to work with of an active southern jet stream, colder conditions across the Deep South up into the Ohio Valley and mid-Atlantic, and generally mild conditions across the northern tier of the U.S.
We also are monitoring water temperatures in other parts of the world; colder waters over the eastern Indian Ocean will likely enhance the cold conditions over parts of the eastern United States caused by the El Niño. Warm waters across the northern Pacific will promote a ridge in the jet stream along the West Coast into Alaska, another factor that can enhance the generally cold weather over the East. 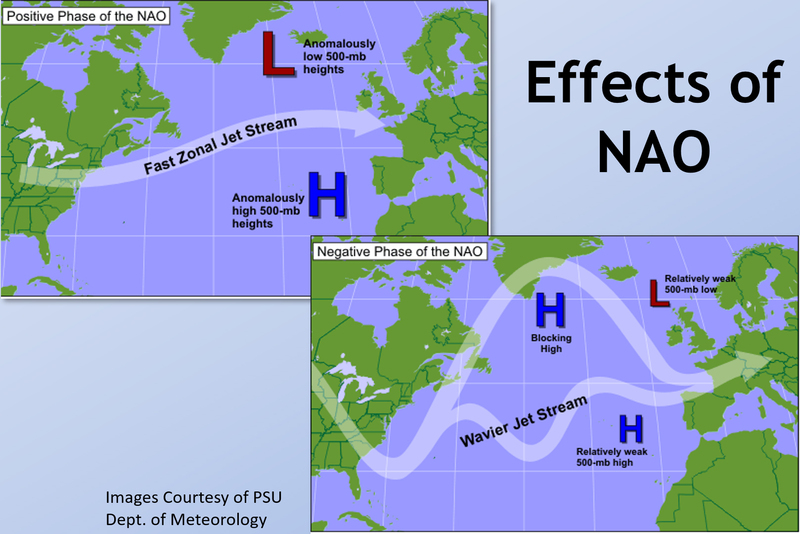 The El Niño, Atlantic water temperatures, and a minimum in sunspots also argue for “blocking” in the northern Atlantic, referred to as a –NAO pattern (often characterized by high pressure over Greenland). This development would further support a trough or dip in the jet stream across the East and Southeast (promoting cold temperatures), along with an increased risk for nor’easters with heavy snow in the mid-Atlantic and Northeast. Just to reiterate the importance of a –NAO, it was a key component in last March’s cold and overly stormy weather pattern. So, what does this all mean for the U.S. as a whole this winter? In general, the expected pattern will promote a warmer than normal western half of the U.S. with some of those above normal readings bleeding into the northern Plains and the Great Lakes. Colder than average conditions will be expected from Texas through the Southeast U.S. and into the mid-Atlantic & southern New England. As for snowfall, look for above normal snow in the Intermountain West, average snow across the Great Lakes, and above normal snowfall from eastern PA and NJ northward into New England & Maine due to a storm track along the coast. The Midwest will likely miss the majority of the big storms along the eastern seaboard, but will still have a good bit of smaller events from clippers. However, the region will end up slightly below normal in the snowfall department. Wet weather can be expected in northern California and across the Gulf states as the southern jet stream will keep things active. 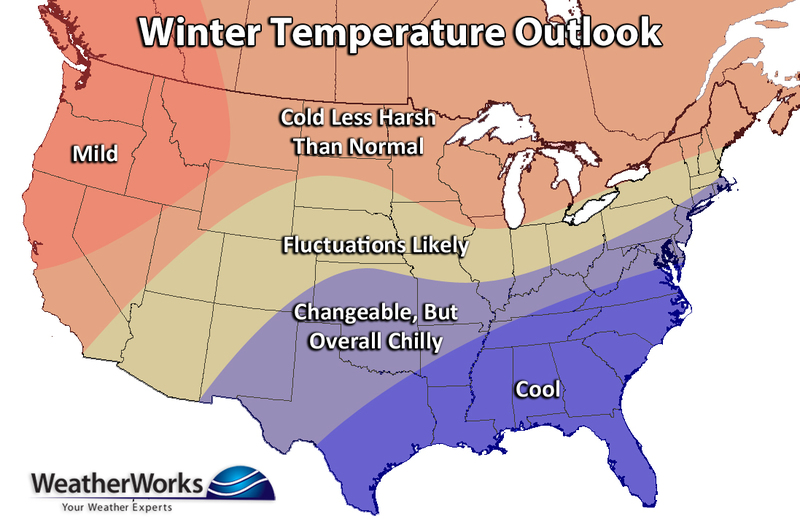 More specifically for Northeast U.S., the first half of December will be chilly, but the coldest period will be from the end of January through February and into early March. Even though this seems like a long duration, it won't be cold straight through winter. We think a good bit of November and the end of December, near the holidays, will be rather mild... which might ruin white Christmas prospects for many. This mild stretch could even last into mid-January. Although the interior and northern mid-Atlantic into New England will be favored for some snow early in December, the snowiest period will likely be from February into early March. This period will be the best window to see "the big one" as nor'easters will be distinctly favored due to the active southern jet stream providing moisture, and a predominantly -NAO state guiding the storm track up the East Coast. In New England, strong instances of high pressure may work against an overly snowy year and suppress a few storms to the south. Either way, this should be an interesting winter season to say the least. 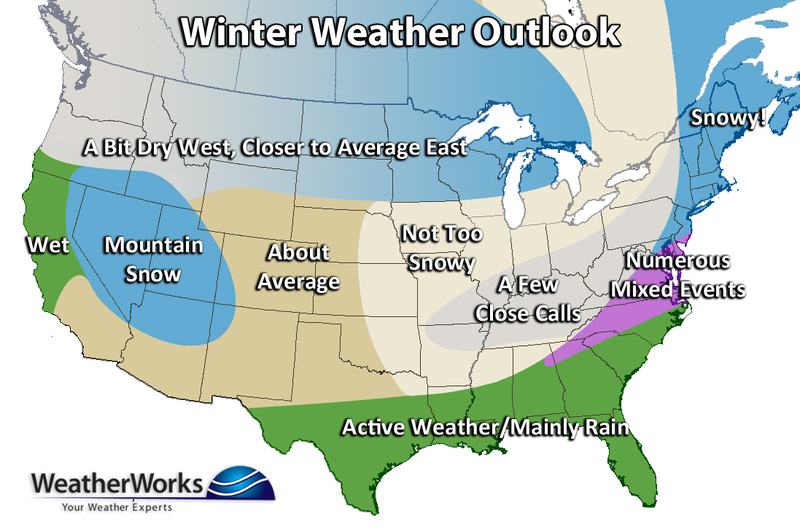 Keep updated with WeatherWorks by visiting our social media pages! You can find us on Facebook, Twitter, Instagram, Youtube, and Linkedin. And don't forget, we have you covered all year long with Storm Alerts and during the winter with Certified Snowfall Totals.